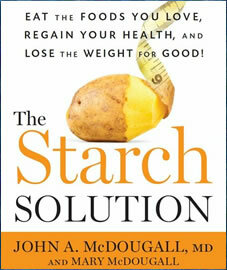 The Starch Solution by Dr. John McDougall says there is a specific diet that best supports the health of every animal. And according to him the ideal diet for humans is based on starches. In The Starch Solution, he asserts that eating more rice, corn, potatoes and beans is the secret to losing weight. Not only that – it will improve your wellbeing – as well as helping to save the planet. McDougall explains that scientific experts have long concluded that we are designed to eat a diet consisting mostly of plant foods. Recent research has shown that we produce up to eight times more starch-digesting enzymes in our saliva than other primates. McDougall proposes this as evidence that the foods best suited to human physiology are starches. The diet recommended by McDougall consists of 70 percent starch (rice potatoes, beans etc. ), 10 percent fruit and 20 percent vegetables. You will center the food on your plate around starches with the addition of nonstarchy vegetables and fruit to add color and flavor. You can also add fat-free seasonings for variety and to make your meals more interesting. Foods containing starch – like rice, potatoes and beans – are very low in fat making them ideal for weight loss. Starches promote satisfaction and enjoyment of food by stimulating the sweet taste buds. Most people enjoy eating them and refer to them as “comfort foods”. They are a good source of nutrients including proteins, essential fats, vitamins, and minerals. Some starches such as potatoes and sweet potatoes can be regarded as complete foods because they can meet all of our nutritional needs. On this program you should avoid all meat, fish, dairy, eggs, animal fats such as lard and butter, vegetable oils including olive oil, processed and packaged foods (except those containing only permitted ingredients). McDougall advises avoiding these foods all the time for the rest of your life. It is probably all right if you break the diet once or twice a year. But indulging too often makes it hard to get back on track so it is better to avoid these foods altogether. There are a few foods that are allowed but they may slow your progress. This includes avocado, dried fruit, fruit juice, nuts, seeds, and simple sugars such as maple syrup. They are best consumed in small quantities as part of a starch-based meal. If you want to accelerate weight loss or are recovering from a chronic disease you are advised to avoid these foods altogether. Whole grain bread, pasta, brown rice, oats, corn tortillas, lentils, pinto beans, chickpeas, black beans, potato, sweet potato, butternut squash, pumpkin, green vegetables, fruit, tofu, soy milk, cashew milk, natural peanut butter, fat-free salad dressing, salsa, soy sauce, fat-free cocoa powder, herbs and spices, agave nectar. The Starch Solution does not require you to follow a specific exercise plan. As long as you follow the diet guidelines you will lose weight and improve your health. To achieve maximum weight loss you should exercise more frequently because it burns more calories and reduces your appetite. The Starch Solution: Eat the Foods You Love, Regain Your Health, and Lose the Weight for Good! Retails at $26.99. May reduce the risk of conditions including diabetes and heart disease. Most people enjoy eating starchy foods like bread, pasta, rice and potatoes. Does not require calorie counting or restricted portion sizes. Offers advice for faster weight loss results. Contains inspiring patient testimonials of weight loss and recovery from medical conditions. Very restrictive and requires elimination of many foods including meat, fish, eggs, dairy and oils. Some dieters may experience digestive discomfort when starting the diet due to increased consumption of fiber. Unless carefully planned, the diet may be low in certain nutrients such as zinc, selenium and vitamin B12. Difficult to eat in restaurants and at social events. May require more time for food preparation. The Starch Solution outlines the scientific research in support of the health and weight loss benefits of a starch-based diet. It is a low-fat, high-fiber diet, which should enable most people to lose weight effectively. Unlike some low-fat diets this program is centered on fresh and unprocessed foods, with strict avoidance of refined foods. This makes the diet suitable as a lifestyle approach to healthy eating with the potential to dramatically improve general health. How about when your recovering from anorexia? How much weight will I gain and when will it stop?